for 2-and 3-piece cans with 65mm dia, such as beer cans and 209 cans. The cutting process is so precise, quick, safe and convenient to ensure precise cutting effects without distorting the cans. 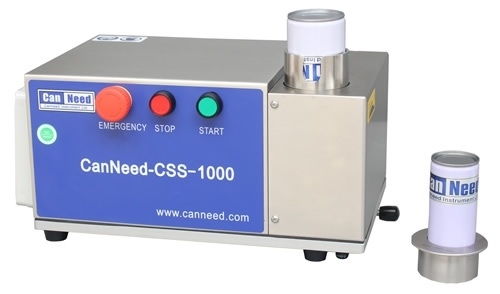 The seam image on Canneed series Seam Sight TM automatic seam measuring systems gets thereby every clear and improves measurement speed and reliability. Feature: Extra hard steel saw blades, so firm and durable to ensure a very plain cut surface. CSS-1000 adopts multi-security features to ensure the safety of the operators to the greatest extent. Security One: The proximity switch is installed near to the blade. Only when the can is put in, can the motor start. Security Two: The proximity switch is installed on the machine housing. Only when the machine cover is closed, can the circuit of the motor be connected. In this way, it can avoid the injuries because of the incorrect operations when disassembling the machine cover and replacing the blade, clearing iron scurf and so on. Security Three: An Urgency Stop switch is installed by the operation button. If any incorrect operations happen, the operator can cut off the power at once, ensuring the operator’s safety. Speed : approx. 1,000 r/min.